ADHD, ADD, hyperactivity, inability to focus. These labels are all well-known these days in schools, and amongst parents. According to the CDC (Center for Disease Control), the number of children who have or have had ADHD is in the millions. I have a child who suffers from Inattentive ADHD, aka ADD. Simply stated, he has a lot of trouble paying attention and focusing. My son doesn’t exhibit many of the hyperactive symptoms; in fact, he’s a pretty laid back kid. His problem is what you might call “Squirrel Syndrome”. Homework that should take an hour to complete takes him several hours because he is so easily distracted. My husband and I are adamantly against the use of stimulant ADHD medication for our son’s particular issue. We have talked at length with his doctors and teachers about ways to help him. Here are seven ways that we have helped our son be a more successful student without medicating him for his focus issues. Make Checklists – Our son is very forgetful. Utilizing checklists to help him remember what he’s supposed to be doing, like what items need to go into his backpack after homework is completed, is very helpful. Routine – Try to keep your after school routine the same; free time, snack, homework. My son plays sports after school part of the year; we adjust our routine for after practice or games. Some nights, after games, my son chooses to go straight to bed and get up early in the morning to complete his work. Get a Second Copy of Textbooks – We have a complete second set of textbooks at home, this just makes one less thing our son has to remember. Communicate with Teachers – Talk with your child’s teachers to work as a team. Most schools have some sort of online program to check in on lesson plans and homework. Teachers want your child to be successful, too, and most are willing to make some accommodations to help your child. 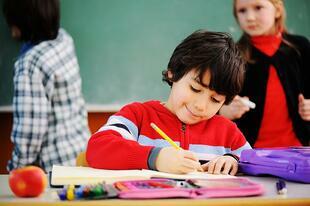 Sitting up front, and giving a little extra time to complete a test are examples of ways that may help your child. Prioritize Homework – Make a list of homework on a dry erase board, and have your child finish the easiest homework first, so it’s done and off the list. Then, move on to the harder work. Diet and Vitamins – We try to feed our son a low-carb, low-sugar diet. It keeps him more focused and his mood steady without blood sugar lows and highs. We also give him Omega-3 vitamins as well as a Gingko supplement. Pray & Give Them Time – Being a Christian family, we have prayed a lot about our son and his focus issues. We have found great comfort in prayer and trusting the Lord to guide us in how we help our son. We also know that each child develops at a different rate, and a few months can make a huge difference in maturity. I won’t say it has been easy, but we have used all of these steps and more to help our son without medicating him. We have seen such growth and maturity in him each year. We have watched him turn into an A and B student with an occasional C. We are confident in our decision and pray we are equipping our son with tools to be successful and prepared in life. Every child is different and medication might be the best treatment for your child. I encourage you to work with your child’s doctor and teachers to come up with the best plan to help him or her succeed in school.